What is a U.S. Postal Inspector? U.S. 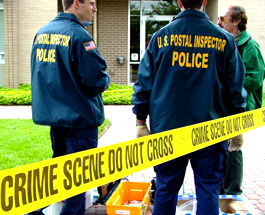 Postal Inspectors investigate criminal allegations or incidents involving the sending or receiving of mail using the United States Postal Service. Postal inspector’s serves as the primary investigative law enforcement unit for the United States Postal Service and have broad ranging authority to conduct interviews with suspects and witnesses, perform analysis on mail deliveries or receipts to uncover criminal wrongdoing, and work with other federal, state, and local agencies to solve criminal cases. US Postal Inspectors are involved with the Department of Homeland Security and may be involved in tasks related to counterterrorism. The broad range of jurisdictional authority makes the inspector one of the more prestigious federal agent.